In 1988 at the age of 16, Carl made his debut as a substitute for Rochdale but failed to impress and was later released. After periods at both Burnley and Stockport County (plus a loan period at Morecambe), he made the decision to drop down to non-league football, joining Witton Albion where his knack for goal-scoring flourished. In the summer of 1993, he joined Macclesfield Town of the Conference for a fee of £1,700, and then later joined Kettering Town for £25,000 the following summer. After scoring 54 goals for Kettering in 18 months, Rushden & Diamonds’ offer of £85,000 (a non-league record) was enough to persuade the Poppies to sell their prize asset and he arrived at Nene Park at the end of March 1996. He made his debut in against promotion rivals Halesowen Town on 30 March 1996, scoring Diamonds goal in the 1-2 defeat, but it was Diamonds that pipped Halesowen to the Southern League title, mainly thanks to Carl’s six goals in the nine remaining games of the season. The following year, Carl was joint top scorer with Darren Collins, but he fell out of favour with manager Roger Ashby and was placed on the transfer list on 25 November 1996. With no offers, he returned to the side the following month. 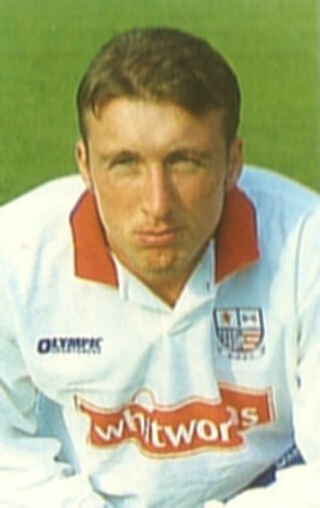 Brian Talbot took over in March 1997, and he continued to make the side, but he was dropped after just five games at the start of the 1997/98 season and was loaned to Dover Athletic in February 1998. He was recalled and sold to Stevenage Borough on a free transfer in April. He scored more than a goal a game at Stevenage, and was snapped up by Doncaster Rovers in May 2000 for £50,000. The goals dried up again however, and after a period on loan back at Kettering Town in January 2001, he joined Yeovil Town in the summer helping them to lift the FA Trophy in 2002. The following season, he was on loan at Nuneaton Borough and was released by the Glovers in May 2003. He went on to play for Gainsborough Trinity, Woodley Sports, Leigh RMI and Nuneaton Borough (again) and was last noted plying for North West Counties League side New Mills AFC in the 2006/07 season, although he is no longer on their books. He is now looking at pursuing a coaching role.